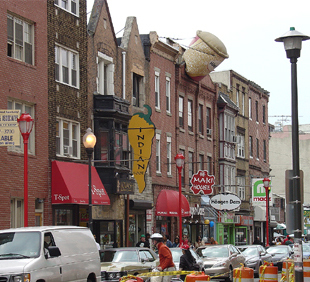 South Street in Philadelphia, PA.
I’ve lived in three great row house cities: New York, Baltimore, and Philadelphia. Say what you will about the quirks and negative things, all three cities have an abundance of row houses. But what makes a really great row house neighborhood? What if we started from scratch? We can start with William Penn’s original concept for Philadelphia. Arranged in a neat rectangle-shaped grid, the avenues were wide, and the spacious lots allowed for each home to have a garden. He wanted the city to be situated near commerce and tradespeople but the outlying areas to remain pastoral. William Penn was wise to design public green spaces into the city. Even a small park is a wonderful asset. Along with quiet places, playgrounds are also requirements for a good quality of life for many types of residents. Larger parks are great for concerts and sports. Penn wasn’t very keen on the idea of crowded, attached dwellings because in Europe many large cities had been plagued by huge fires that consumed much of the urban areas, so he made sure to allow for a lot of elbow room in his concept. If Philadelphia hadn’t gone through the population boom that it did, Philadelphia might have stayed as spacious as Penn intended. However, people wouldn’t have built homes between the blocks and we wouldn’t have the wonderful small streets that we have here. The small, in-between streets are often hidden from main roads and provide privacy and intimacy that you don’t get when your house faces a busy street. People who live in on such streets often form mini-communities. These small blocks are wonderful for children since cars aren’t always zipping by. A balance between the broader streets and avenues, and the small alleys and narrow blocks, provide a nice variety of options in the ideal row house neighborhood. Court Street, a main shopping thoroughfare in Cobble Hill, Brooklyn, New York. The corner delicatessen is a staple in New York City. Often, the first act of independence for an urban child is the unaccompanied trip to the corner store. These small mom-and-pop establishments are usually run by local people and nearby residents frequent them daily. Often, you will run into your neighbors and get a quick update on the local news and gossip. A vital part of any urban neighborhood is its community and the corner deli, or coffee shop, or nail salon (lately they’re everywhere!) is the essential meeting place. These are just a sample. 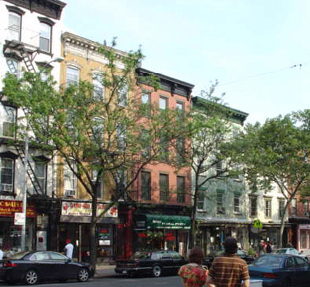 In well-established row house neighborhoods, there is almost always a main street with shopping. Typically, the stores are built within a row house structure and people live above the shops. Shopping in a row house neighborhood is more like visiting friends. The ideal row house neighborhood will have readily available services such as a post office, police station, firehouses, banks, veterinarians, hospitals, public elementary schools, public gyms and swimming pools, daycare, places of worship, and public libraries all within walking distance. Ideally, several row house neighborhoods would be situated around a central urban hub for larger business and municipal buildings, not to mention theaters, zoos, universities, and museums. It goes without saying that any ideal row house city must have a good public transportation system connecting the smaller row house neighborhoods to the city at large. Aesthetically speaking, not every row house must or should look the same. It’s nice to have variety on different blocks. Materials and size shouldn’t vary too widely within a block but not all blocks need to look alike in order to create a visually pleasing neighborhood. It’s more important to have every house well-kept and every block clean. Above all, any row house neighborhood needs to be safe. The local government and community must be committed to providing and contributing to this. Of course, when you live in such an awesome place, you’re going to get guests. I am such a fan of the bed and breakfast. They’re local and work within the structure of a neighborhood, unlike a high rise hotel. And there you have it. Most of this is readily available in most urban row house neighborhoods, even right here in Philadelphia, which is why I like them so much.